Boxing movies like Bleed For This always comes at the heels of much more famous and more liked films of the same genre like Rocky, Raging Bull, The Fighter and so on. On top of being exceptionally good movies in their own right, they are also the standard-bearer for a particular template that nearly every sports movie tends to follow, namely the one about the central protagonist who for whatever reason is a serious underdog when they undertake a particular sport, and end up winning over the crowd as well as the colourful personalities that are supporting said underdog achieve his dream. 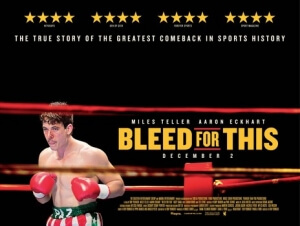 Although it’s safe to say that originality is not on Bleed For This’ side, it still follows the set template to an undeniably impactful effect, not least because it’s based on a fascinating real-life story of a tremendous sporting comeback by boxer Vinny Paz. In the film, we pick up on Paz (Miles Teller) as he’s just barely maintaining his middleweight champion title, and is living a successful lifestyle that is humbled by his extended American-Italian family, including patriarch Angelo (Ciarán Hinds), and his alcoholic trainer Kevin Rooney (Aaron Eckhart). However, a sudden car accident leaves Paz with a broken neck, and a “halo” bracelet that is literally drilled into his head to support the fracture. Despite the severity of the injury leading several doctors, as well as close family and friends, to tell Paz that his fighting days are over, the boxer becomes determined to prove them all wrong by beginning to train again with Rooney by his reluctant side, and even shortly afterwards booking a title match to prove his stability. Filmmaker Ben Younger, making a comeback of his own after over ten years away from the camera, is determined to show the grittiness of the situation, with every major blow from punches in the ring to the near-fatal crash itself containing high levels of force on-screen that leave a firm mark. Younger succeeds in his mission, as it leaves you just as beaten into submission as Paz is when fighting for his life, in both senses of the phrase, and firmly commands your attention as you see him go through some serious setbacks only to come back in blazes of glory. Teller, too, makes for a compelling lead by combining a heavy physical performance (particularly when he has to wear that restricting halo bracelet) with serious charm and swagger that makes this on-screen version of Paz a likable enough lead to want to watch throughout the film. He’s backed up by strong support, particularly from a near-unrecognisable Eckhart as the balding, overweight trainer whose brash personality tends to position him more as an outlandish Mickey Goldmill surrogate than anything, but it’s a role that the actor excels at nonetheless. However, although the inspiring nature of what happened in real life gives the film a solid reason for being, it still can’t help but feel a little light on the dramatic side of things. Putting aside the fact that there are more than a few parallels to be made with other more famous boxing movies – Paz’s dysfunctional family draws a lot of similarities with The Fighter, only with an Italian-American family instead of that film’s Irish-American, while the underdog nature of its protagonist as well as some of the grittier moments of the film being a mixture of Rocky and Raging Bull – there is not much else that holds the film together. For instance, we are never really told why Paz is so determined to return to his fighting career after his accident, only that it seems to be the only thing he knows how to do. Perhaps a bit more insight into this aspect of his personality, possibly in flashbacks that show his love for fighting as a child, would have made the dramatic weight feel a lot heavier than it is, but as is it doesn’t quite make you that invested in his overall arc. The same can be said for a lot of other attempted moments of drama in the film, like Rooney’s alcoholism which is set up as if it’s going to be a major character arc, but doesn’t really go anywhere and is left mostly unresolved by the end of the film. The story of Vinny Paz’s extraordinary recovery and triumphant return is undoubtedly inspiring, but as a film there just isn’t that much to hold it together. However, it is mostly saved by a talented cast and director that make Bleed For This not quite one of the new boxing classics, but a solid enough entry into the annals of the genre’s hall of fame. Bleed For This tells the inspiring true story of boxer Vinny Paz’s comeback through some gritty direction and solid performances by a cast led by Miles Teller, but dramatically there isn’t much to hold it all together.